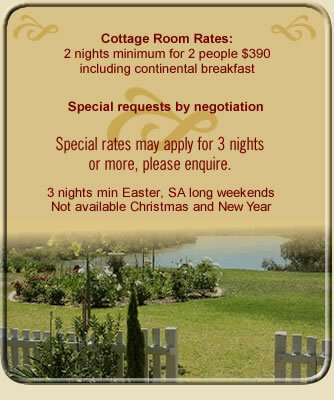 Paringa House Bed and Breakfast Stone Cottage styled rooms are an ideal romantic getaway for a couple. Enjoy the cottage styled rooms as they mix the old with the new. Each room has been beautifully furnished with antiques, brass beds, polished jarrah floors and a gas open stone fireplace. They are all well equipped to make your stay as comfortable and indulgent as possible. Each room has a private verandah with your own BBQ overlooking the spectacular Murray River. Visit the Riverland and experience a little bit of history, try some great wines or even a round of golf.